Effective April 1st, we will start taking tee times on Friday, Saturday and Sunday. Please call the Pro Shop 236-5637 ahead of time to make your tee time. We will have a starter on Saturday and Sunday. I believe this will help the pace of play and make it easier on everybody. We are going to get several quotes on patching and paving the cart paths on the front 9. This will take place early spring. BRCC Board of Directors approved Lee Coomes to build and regrade the following senior tee boxes and the entire tee box on hole 4: 1,2,3,4,5,6,7,11,12,13,14,15,17 and 18. The grading was finished in November. We seeded with perennial rye and winter rye. We will overseed in the spring and hope to have them open Late Spring. This project will add value to the golf course. Everyone will enjoy the new tee boxes. We have redone the drainage on Hole #5. It will play as a Par 3 for a while until it is cleaned up and seeded. We installed over 2000 feet of corrugated pipe, 8 dump truck loads of gravel, 15 drain boxes and 6 outlets to the big creek. Thank you for your patience while this project will finish. 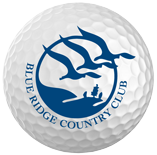 Congratulations to the ladies who recently won the 2015 Blue Ridge League Championship. The team competed against six other clubs in Southwest Virginia. Great job ladies!! Congratulations also go out to club member Alice Hill who is the 2015 VSGA Senior Women's Fifth Flight Winner. The event was held at the Homestead in Hot Springs, Virginia and attracts the best women golfers in the state.